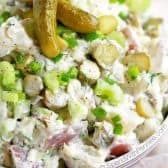 This Dill Pickle Potato Salad is deliciously and loaded with crunchy dill pickles in a zesty dill pickle juice infused dressing! This potato salad makes dill pickles the star of the dish making a side that’s going to be the hit of any summer bbq! Cut the potatoes and chop into bite sized pieces. Boil the potatoes until tender (approx. 15 minutes). Cool completely. Slightly mash a few of the potatoes.